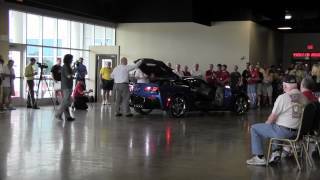 Chevrolet unveiled the 2014 Chevrolet Corvette Stingray Premiere Edition at the National Corvette Museum in Bowling Green, Kentucky. The Premiere Edition is designed specially to celebrate the 60th anniversary of the Corvette. The Premiere Edition gets a Laguna Blue Metallic exterior with a visible carbon fiber roof and a "carbon flash hood stinger stripe". It is also equipped with chrome wheels that have stingray badges in the centre. All Premiere models are set to incorporate a custom vehicle identification number beginning with 300001. Interior changes include suede-wrapped interior trim and carbon fiber accents as well as an exclusive numbered ‘Stingray’ plaque. The 2014 Chevrolet Corvette Stingray Premiere Edition is the most powerful base Chevrolet Corvette ever produced, powered by a 6.2-litre LT1 V8 engine that is capable of developing 460bhp and 630Nm of top torque. The car is able to sprint from 0 10 100 km/h in just 3.8 seconds.